We tend to obsess over the mirror, right? Try to walk by one and NOT look at yourself. I mean, it's hard. And almost completely natural. But it's not always healthy because we start to judge ourselves by what we see, and then what we see is eventually distorted by the self-judgement. Remember: Mirrors tell the truth, and our minds interpret that truth. So don't let the mind misinterpret the mirror. Let's take this concept one step further: A lot of times, we exercise to fit into jeans or to look good in a bathing suit. Maybe we want our muscles to pop perfectly to impress others. But seriously, is that logical? Is that really why we should be exercising? Because honestly, that's the result of the outside falling into place. 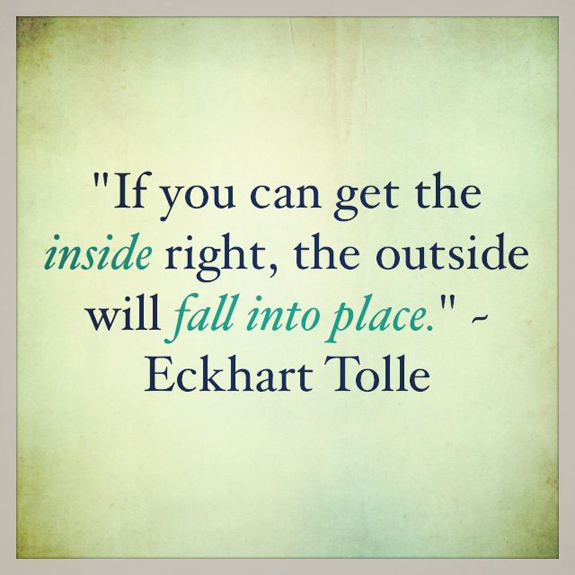 But the outside won't fall into place if the inside isn't right. Thank you, Eckhart Tolle. So exercise to be healthy. Exercise for everything within the skin, not for what the skin looks like on the outside in the mirror. When you make life changes to incorporate good health and wellness, that's truly when you'll feel a difference. And when you can feel the difference, that's when you'll start seeing it, too. That's when you'll be in sync. And that's all I've got for today, so bye-bye-bye! Question: Why do you exercise? Very well said! I started to "get fit" to fit in my wedding dress and it has turned into a passion and lifestyle, now I stay fit so that I can be the best mom I can be. My son is due in July and I want to be able to keep up with him and someday with his kids. Heart disease runs in my family so by staying fit I plan to thwart heredity and stay active and healthy as I age.